Ah Fu sought to protect his master but in the end, only made things worse. Jim Hanley would never have elected to bury himself in Shanghai from choice. But an early error in judgment regarding New York laws and the course the stock market would take had resulted in his residence there for more than twenty years. Everybody had liked Hanley and most people liked him still. Ah Fu, his Chinese boy, literally worshipped him. Yet after his initial mistake and narrow escape from a term in Sing Sing, Hanley found that no one but Richard Morely was willing to trust him. It seemed rather unfair. He thought they might have given him another chance without forcing him away from Manhattan; but his wishes in this respect had proved in vain. The onus of his youthful misstep had survived long after the actual circumstances of his defalcation had been forgotten. It was true that Hanley had not personally profited by his fraudulent act. Badly advised by his tempters, he had lost every penny of the sum he had embezzled. There were also extenuating circumstances, but the men who had been Hanley's friends did not wish to continue their association with him, even though some of them refused to prosecute. Others were not so conditionally forgiving, and he had found himself facing a warrant. The woman he loved gave him his congé. Those to whom he appealed for loans to replace what he had stolen turned from him in cold contempt. He was a social outcast — a fugitive from justice — and a penniless, broken-hearted man. Only Richard Morely had stood by him. It was Morely who hustled him aboard the train for Canada before the police could arrest him; Morely who arranged his passage on the big P. & O. steamer; and Morely who had given him a job. The whole affair culminated at the time Morely was forming his Yellow Dragon Trading Company. The business was a modest one and demanded but little of its manager besides routine attention. It practically operated itself, yet it was a profitable enterprise and enabled Morely to pay Hanley an adequate salary. That his doing so was little more than charity everyone knew. A local Chinese bank could have handled the matter and undoubtedly would have done so much better than Hanley could. But for over a score of years Hanley had spent his days in the little office near the Bund and his nights in the adjoining bungalow, just beyond the European quarter of the city. He belonged to no clubs and had but few intimates — chiefly those of his own ilk, who railed at the despicable climate of Shanghai, despite the fact that they found it more healthy to remain there than to go home. He was a man of pleasing personality and pleasant manners, reserved and soft spoken. He did not play the races and he did not gamble, so far as anyone knew. Most of his spare time was spent alone with his books, and if a woman appeared now and then in his life, no one was aware of it. The only living being who really understood Hanley was his native housekeeper, and even Ah Fu was somewhat mistaken in his estimate of the man. At first Hanley had been aided by two assistants, but in time the business grew so automatic, and so relatively unimportant to its owner, that Morely directed him to do without any clerks. Willingly Hanley had dismissed them, and when he had done so, Ah Fu laughed in his flowing sleeve. He had seen for some time that his employer had been ill at ease, and he thought that Hanley breathed a sigh of relief when the others were gone. Ah Fu also knew that Hanley spent very little. He knew that a tidy sum, to which Hanley was ever adding, lay safe in the Manchu Bank. What was more, Ah Fu had gathered that Hanley was discontented, and would welcome the day when his exile might be ever — if ever, indeed, that day should really dawn. Hanley hoped it would, and Ah Fu hoped so, too; for the Chinaman longed to see the rest of the world. He knew that Hanley had grown so used to him that he would keep him as his servant for the rest of his days. Hence the departure of Hanley from Shanghai would mean the beginning of the travels of which Ah Fu dreamed. Hanley had taught him English and something of the business. He had loaned him books and told him stories of other countries, as well as making Ah Fu a sort of secretary. By the time the Chinaman had mastered the spelling of English he had contrived to pick it out on the keys of a typewriter. He would make up long statements each January and July, from lists of figures supplied him by his master. These lists Hanley would compile from the private books he kept — books that were always under lock and key and which no one but Hanley ever looked into. Morely had not been out to Shanghai since the day of Hanley's arrival, and the letters the two exchanged were formal in the extreme. Morely had not wished to humiliate his friend by referring to personal matters, and Hanley had not presumed upon the other's kindness to make their communications savor in any way of a casual correspondence. All of which was well enough as long as Morely lived, but shortly after the world war Morely suddenly died. He had not been married and consequently had no direct heirs, but Hanley learned in due time that the estate had been left to a distant cousin. The man's name was Burson and he lived in San Francisco. It seemed that he had never traveled to the Orient and was suddenly possessed of a strong desire to do so. Hanley dreaded his visit on several scores, neither of which he took occasion to mention to Ah Fu, feeling that the Chinaman could never understand, and that, in any event, it was none of the servant's business. 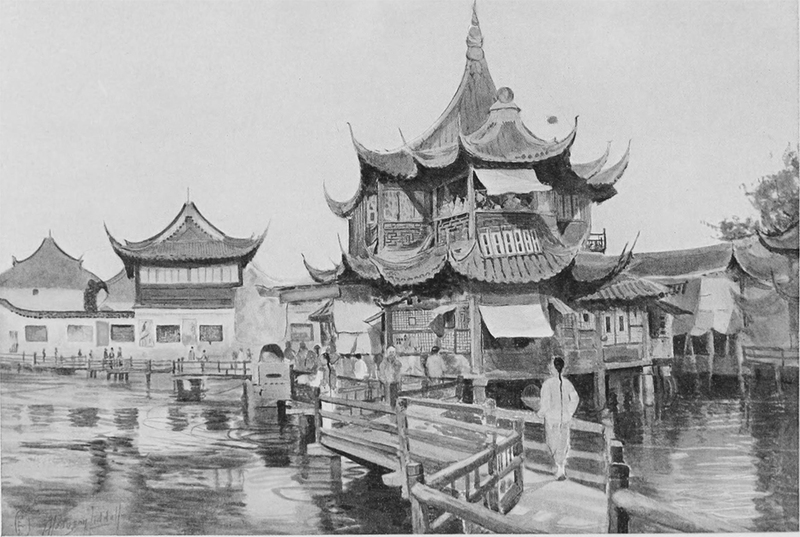 Hanley believed in keeping his own counsel and in living much by himself, although he was aware that Ah Fu as well as all Shanghai knew of the events which had resulted in his coming there to live. Yet if Ah Fu was honest himself, whether because of virtue, or perhaps from necessity, he seemed to hold no contempt for Hanley on account of his criminal record. In fact, Ah Fu felt that a man who was crafty enough to take advantage of another in the matter of money was a person to be regarded with the greatest of respect. So he typed his letters and made Hanley's bed, and cooked his employer's meals, without concerning himself as to what was written in those mysterious books whose pages his eyes had never scanned. But Ah Fu grew troubled as Hanley's annoyance seemed to increase. Other letters from San Francisco caused Hanley sleepless nights, and Ah Fu observed with concern that Hanley no longer relished the food he prepared. He wondered whether something might not be wrong, and whether he could not somehow set that matter right. Knowing that Hanley had once been a thief, the Chinaman supposed that he might be again. He shrewdly surmised that those guarded books would divulge the story, if the actual figures in them were ever to become known. That Hanley doctored the financial statements he sent out twice a year. Ah Fu had no doubt. To be able to do such a thing, and to do it for twenty years, was an accomplishment of which Ah Fu would have been proud. In his estimation, Hanley was a brilliant man. But be that as it might, he was a obviously worried one. His restlessness grew with the coming of each steamer, and Ah Fu heard him sigh with relief when it was announced by letter that the new owner of the Yellow Dragon Trading Company had decided not to come out. Instead, he was informed, Mr. Burson was sending an auditor over from Hong Kong. The man would look over the books and also look over the ground. He would decide whether or not it would be best to continue the business or to close up its affairs. The latter would mean Hanley's dismissal, if it resulted in nothing else — and Hanley did not know what he would do in that event. No one in Shanghai would give him a job. The charge which stood against him back in New York was outlawed by time, of course; but the memory of the man and his folly had not passed from the minds of those who still remembered him. He could not go back to the States. He had no money with which to travel elsewhere — and he did not want those books to be examined. Ah Fu sensed this from his master's manner rather than from anything Hanley said. He only knew that Hanley viewed with apprehension, the arrival of the auditor who was coming from Hong Kong. At first Ah Fu was puzzled and then grew upset himself. He would gladly have laid down his life for his master, but sacrificing his life would not seem to help in this instance. Yet Ah Fu was far from being stupid. He had a mind that was keen in its Oriental cunning. Now was the time to employ in the service of his master the abilities with which he had been born. Ah Fu said nothing, but went quietly v about his business, and Hanley had no inkling of what was in the Chinaman's mind. He did not even know that the servant suspected him of having been steadily robbing the Morely estate. Yet this was precisely what Ah Fu did imagine, and what he fully intended to try to conceal. With the falsifying of books, he had no familiarity, and no desire to learn. Such methods were utterly foreign to his plan of procedure. His manner of mending matters would be more direct and simple, and by far more effective. All that remained to be done was to await the arrival of the stranger who was en route from Hong Kong. In the course of three weeks he came. The man's name was Clayburne, and young as he was in business, he had built up a reputation as a financial efficiency engineer. He had faith in the Orient as a place in which to make money, but he was the relentless foe of antiquated methods. Naturally, he assumed that the system of running the Yellow Dragon Trading Company was at least a decade behind the time, and surmised that a lot of red tape and lost motion, and perhaps inefficiency, would have to he eliminated if the concern was to go on. That was what he had come to Shanghai prepared to find out, at the instance of Mr. Burson. Hanley, pale and nervous, met him at the dock, and greeted the auditor as cordially as he could. Clayburne pretended not to notice the other's all too evident perturbation, but what he did see, plus what he knew of Hanley, made him decide at once that something was wrong. Hanley realized his attitude, and resented it keenly. Ah Fu sized up the situation at once, and quickly made up his mind. However, he outdid himself in preparing the evening meal and in making the new arrival comfortable in the bungalow. He served the two Americans in silence and kept them well supplies with liquors and cigars, listening with the sharpest of ears to each sentence the men exchanged. That the business had fallen off in the last five years, Ah Fu had known before hand. That Mr. Morely had been indifferent to whether or not it paid, he had not known before. Morely, in fact, would never have consented to a discontinuance which might cost Hanley his job. He had been that type of man, and the maintenance of his former friend in this quiet berth was only another one of his many secret and worthy charities. To Mr. Clayburne, the thing which he suspected made Hanley's probable offense all the more reprehensible under such circumstances. "Once a crook — always a crook!" he mused at the close of the dinner. "There's no such thing as a defaulter ever going straight." It seemed as though Ah Fu read his mind, but so far as his features indicated such knowledge he might have been a graven image. If Hanley was conscious of the other's mental attitude, he did not outwardly evidence the fact, but he found himself more restless than ever after dinner when the two sat out on the porch overlooking the harbor and the lights of the city. "When do you wish to start in?" Hanley asked with a queer sort of catch in his voice. "In the morning," the auditor said, "and finish as soon as I can. Mr. Burson wants my report to go back by the Pacifica and the ship will sail on Tuesday. So there's no time to be lost." So it seemed, Hanley observed. "Quite so," thought Ah Fu, but he was not thinking of the task the auditor had to perform, but of the little job he personally had in mind. In the kitchen, he went about his tasks without so much as a word, and at last, when all was in order, he slipped out into the night. He said nothing to his employer about his going, and naturally did not confide to him what he proposed to do. But half an hour later he was in the shop of Moy Su down in the Nanking Road. With Moy Su he exchanged a few complimentary salutations, felicitated him upon his ancestors, and requested Moy Su to do him a favor. Moy Su, without the impertinence of asking questions, consented to do as he was requested, and Ah Fu went on his way. Ten minutes later Hanley was summoned to the telephone in his little bungalow. It was Moy Su who greeted him respectfully and begged a thousand pardons for disturbing him at that hour. He made no mention of Ah Fu, a visitor was in the company of Hanley, nor did he refer to the fact that he knew Moy Su was not supposed to be aware of such things, and Hanley naturally never associated the call with the departure of his servant. Moy Su wished to know whether Hanley would care to come to his shop that evening to see a shipment of reprehensibly inferior jades he had just received. The stuff was the merest trash, Moy Su explained, yet it had the appearance of being very good. It was just such merchandise as Hanley sometimes purchased and sent to America in the course of his business. Moy Su wished Hanley to have first choice of the jades, should Hanley wish to buy them, and on the following morning he had promised to exhibit them publicly. Hanley thanked the merchant for his courtesy and decided to go at once. Normally he would have told the Chinaman to go to the devil. Twenty years in Shanghai had not tended to speed up his methods of business or make him unduly active in matters of this sort. Now, however, under the watchful eye of Clayburne, he thought it might be good policy to show interest and act upon the opportunity at once. He felt that it was incumbent upon him to make a show of enterprise and devotion to duty. So he told the auditor the purport of the phone call and asked whether he would care to accompany him. "No," declined Clayburne, "I'm rather tired tonight, and I haven't quite got my land legs as yet. I know nothing about the value of such things anyway. I can tell from a set of books whether a business pays, but I couldn't determine the worth of actual merchandise on a bet." Hanley was just as well satisfied. He would welcome being relieved of the auditor's society for an hour or so at least. The thing he would have to face would be unpleasant enough when he came to it the following morning. Then would take place the interview Hanley had dreaded for years — the inevitable nemesis he knew he must encounter. And Clayburne gave no sign of being likely to be a sympathetic listener to the news which awaited him. "Then," said Hanley, "I'll run down and see this man, if you don't mind. Just make yourself at home and I'll return as soon as I can." "Don't hurry," yawned the auditor, evidently equally willing to be rid of his host. "Sandman's after me and I think I'll turn in soon." "By all means," invited Hanley. "My boy has gone out, I think, but I'll see myself that everything's in order in your room." He did; arranged various articles to insure the comfort of his unwelcome guest, and then went out, first slipping an automatic into his trousers pocket. He had hesitated at first to take the gun, and finally did so with the thought of protection rather than with the intention of employing the weapon for any other purpose. The night was balmy and clear, so he went on foot to the shop where Moy Su was waiting, bowing and scraping and ready to pay him fulsome compliments while he bargained with him. Yet it developed that there was to be no business transacted that night. Indignantly, Hanley spurned the offered jades and roundly admonished Moy Su for even summoning him to look at such trash. He would have none of it. Genuinely annoyed at the merchant and out of sorts with himself, he went out into the night, and retraced his steps. As he pondered over the situation, his fingers closed on the gun in his pocket. Perhaps, after all, that was the way out. He knew what Clayburne would find when he looked at the books, and he appreciated that nothing he might say would explain away those facts. His previous story was already known by the new owner, and Hanley did not deceive himself that Clayburne would believe him or that Burson would forgive him. After all, it might be as well to blow out his brains and have done with it. Perhaps he should have done so twenty years ago. Life had held nothing worth while for him since he had left New York, and he supposed it never would. There seemed but little purpose in his carrying on. But whether Hanley was a coward, or whether it was because he scorned a cowardly act, he took his hand from the gun and resolved not to use it. Whatever the result might be, he meant to go over the books with Clayburne in the morning and confess to him the truth. They might accept his statement or reject it as they pleased. They might do with him as they liked. Hanley did not care — and that was the simple truth. If he could not vindicate himself — and he did not believe he could — nothing really mattered. He had tried his best but fate seemed to be against him. Then, as he walked up the lonely road, lined on each side with tall trees, he heard a noise just ahead and a great, threatening shape hurled itself at him with a savage snarl. Thrusting his hand into his pocket, he squeezed the automatic, discharging it without troubling to take it out of his pocket. The bullet ripped his trousers, and flew wild. But a moment later, as he stood with the weapon in his hand, Hanley laughed at himself. Down the road a big, terrified dog was scampering. He could plainly see its shadowy outlines as it rushed through the open. He was nervous, that was all. There had been no real danger and the animal was only frightened at suddenly coming upon him in the darkness. So he trudged on toward his home at a leisurely pace, until his attention was attracted by a glare in the sky. An uneasy fear came over him and he quickened his footsteps, to pause on the edge of the clearing with an exclamation of horror. His little bungalow and the shack he used as an office were enveloped in flames. Flimsy of construction, the rickety building was burning like tinder. Situated in a lonely spot upon the hillside, it had not as yet been observed by anyone else. With a shout he dashed on — but his cries brought neither aid nor any response from the bungalow. Arriving before the door, he called out Clayburne's name repeatedly, but the crackle of the flames and the roar of their triumph were his only answer. To attempt to enter the building would have been madness, and the roof crumbled in while he stood there helpless. Now he heard others approaching, and he felt a sickening sensation. The crazy fire apparatus was also on its way at a far too leisurely gait. They might as well spare their pains. In a daze himself, Hanley tried vainly to answer a dozen questions at once. To each interrogator he told the simple truth — and each one of them smiled. The arrival of Clayburne and his presence in the bungalow had been known. The intention of the owner of the Yellow Dragon Trading Company to wind up his business had been noised abroad; and Hanley's previous record was not any secret to his neighbors. Moreover, he stood there idiotically with a pistol clasped in his hand. People stared at him strangely. But when the fire had burned itself out and the ruins were cooled with water, the crowd began to search with the aid of lanterns. The Chinese police were darting about like dogs upon the scent, and now they dragged from what had been the office two badly charred, dead bodies. The clothes had been burned from both, but the mystery of it was, why the two victims had been unable to get out. Despite the rapidity with which the flames had spread, a leap through the door or a window would have brought them both to safety. Then the police found out why they had died, and they turned to Hanley, who stared at them in return and gaped at the charred bodies in stunned amazement. Buried in the breast of the auditor was a long Chinese knife. Through the lungs of Ah Fu, a forty-four bullet had passed. A policeman relieved Hanley of his weapon and carefully noted its calibre. Not a vestige of furniture remained in the place. The little office with its books and papers and records of twenty years, was completely wiped out. At the same time the life of the man who had come to examine them had been taken — not by the flames which charred his body, but by the steel which still stuck into his breast. Ah Fu, who also knew a great deal about the business, had passed on to the Terrace of Perpetual Sleep. Of course, they arrested Hanley and clapped him into jail. The examining magistrate smiled at the story of the dog, although Moy Su confirmed the visit of Hanley to his little shop. Moy Su, however, made no mention of the reason why he had telephoned, and only when opportunity came did he slip a note for Hanley into the hands of his lawyer. That note raised the hopes of the man who was going to defend the accused, even though it told Hanley that his case was hopeless. The communication was from Ah Fu and it was done on the typewriter. Hanley knew, of course, that the Chinaman had written it — but there was nothing to prove this fact to a jury. Even the signature could not be confirmed. None had ever seen it. The Chinaman had never thought of that — nor had he planned as shrewdly as his devotion had prompted. To Honorable Police, Shanghai, China from Ah Fu now intending to make himself quite dead. Honorable Mr. Hanley know nothing about killing the auditing pig. Ah Fu have plenty cause hate him man Claybrne. Why so nobody business. Ah Fu stab auditing pig and then take poison to go join little lotus flower because why he kill Clayburne. It was crude fiction. Not even Hanley even pretended to believe it; yet he saw in an instant what the Chinaman had done and why he had done it. He told the lawyer and the attorney understood, but he also realized the utter impossibility of convincing the court. Figuring that Clayburne would find something wrong with Hanley's books, the devoted servant had planned to not only kill the auditor, but to destroy the evidence of his master's supposed guilt. The pretended reason for his committing the crime was of course absurd invention. Hanley did not even know whether Ah Fu possessed a sister or a sweetheart. If the Chinaman had either, Hanley knew that Clayburne had never even seen such a girl any more than had he. Evidently, however, Ah Fu had gone first to kindle the fire, and had then intended to finish Clayburne and later still attend to the taking of his own life. Perhaps he feared that if he lived to be questioned, he might break down under the examining of the magistrate and recant his confession, thus at least compromising his master. By dying himself, he had evidently decided, everything would be well. All Hanley had to do, Ah Fu thought, was to hold his tongue, and no one would be the wiser. And indeed such might have been the case, had it not been for two things which Ah Fu did not foresee. He had not figured the possibility of Clayburne's discovering him in the act of kindling the fire. The knife he had hurled at the auditor had indeed found its mark, but not before Clayburne's bullet had reached Ah Fu. Thus the two wounded men died in the flames. That in itself would not have convicted Hanley. But even the wisest of Chinamen, with the best of misguided intentions, could not have anticipated that Clayburne would earn a gun of precisely the same calibre as Hanley's. Nor could he have surmised that a stray, dog in the woods would cause Hanley to fire a shot under circumstances which he could not prove. As it was, everything pointed to Hanley's having fired the shack himself. Evidence indicated that he had murdered his guest and his servant — one because of what he might discover in going over his books — and the Chinese boy because he knew or saw too much. The very fact that Clayburne had been slain with a Chinese knife looked like a clumsy attempt on Hanley's part to direct suspicion against the Chink. That one shell was missing from Clayburne's gun was perfectly natural. It was supposed he had fired in self defense and that his bullet had caused the rent in Hanley's trousers — the tear which he claimed had been caused by his own shot. It was apparently only a miracle that the ball had not lodged in Hanley's leg. In the face of such supposition, Hanley might plead his innocence as much as he pleased — but he could not contravert the facts as the searchers saw them. "It's tough, old man," his attorney declared, "but we'll do all we can for you." "Save your pains!" Hanley said with disgust. "It isn't worth while. You see, the thing that poor Ah Fu did not know is that I was really honest — "
The lawyer suppressed a smile which Hanley was quick to note. It confirmed his resignation to his fate. "Of course you think I'm lying — not about the murders — but about the money. Yet it's gospel truth I'm telling. About five years ago one of my assistants got away with some twelve thousand dollars before I learned of it. I only found it out after Morely had told me to discharge him. Then, when he had disappeared, I was afraid to speak — naturally imagining that Morely would think I'd reverted to type and was merely trying to clear myself by telling a fanciful tale. There was nothing but silence left for me, because the fellow had cleverly forged my handwriting in making false entries in my private set of books — "
"Did Ah Fu know that?" asked the lawyer, and Hanley shook his head. "He couldn't have known — but in some way or other he scented that something was not just right, and he undoubtedly supposed that I was the crook." "Would those false entries have been discovered by the auditor?" the attorney queried. "Yes," assented Hanley, "and I would have explained them. In that way I could have shown why the figures and the cash in tire bank did not agree. Also that the thefts occurred while I had an assistant. Clayburne might have scoffed at me, but I meant to put every card on the table. With the books to show, I might have been able to make them believe me. As it stands, when they learn that the books are gone, they're certain to consider that I destroyed them and killed Clayburne and Ah Fu in going about it." "Perhaps," the lawyer agreed. "Is there anything in your private accounts or in your bank transactions that would suggest that you appropriated the money ?" "No," said Hanley. "And nothing to show I didn't. Yet, as a matter of fact, I've drawn only half my salary each month since I made the discovery. I wanted to put the money back and thus prevent all chance of my ever being accused. Clayburne arrived about a year too soon. I hadn't quite made it good." For a moment he was silent, and then he shrugged his shoulders and laughed bitterly. "As it stands, Ah Fu's useless and foolish sacrifice not only fails to clear me, but establishes a motive which brands me as a crook as well as a murderer. He has even burned up the deposit book, which would show my honest efforts at restitution. I haven't a Chinaman's chance of proving that I've played straight since my first and only mistake." "I'm genuinely sorry for you, Hanley," sympathized the attorney. "It's rotten, too, after the devotion which prompted that crazy yellow heathen to give his life for you." "Be sorry for him, not for me," Hanley smiled. "If the world's going to think I stole Morely's money after all his kindness. I'd just as leave be hung for murder. Poor Ah Fu did the best he knew how when he tried to help me out; but the foolish fellow will be tortured through eternity when he learns — as the dead surely must do — what a sorry mess his good intentions really made of things."